For some people, writing is an arduous task. They would rather do anything but pay attention to and analyze words—especially when they are writing. But, it is possible to help writers learn how to analyze words in a fun way, intentionally, and with a goal in mind…being specific. Do you want your kids to write words that truly convey depth of meaning? Here’s one way to help them understand how. On a lined piece of paper, draw a rectangular space like the example below. Then, starting at the top, begin with a word that has multiple synonyms. Words that have multiple synonyms are the culprits of generalization, after all, because you have to pick a specific synonym from a whole group of words that may or may not be swimming around in your brain at any given moment. Then, you have to make sure the word you pick makes sense in your sentence and accurately gets your meaning across. As an example, I will use the word smell. See? Right off the bat, out of context, you don’t know if I am talking about how something smells or if I am referring to the act of smelling. 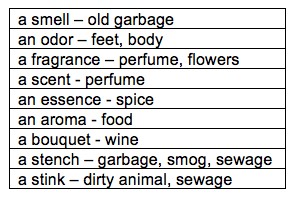 So, back to my rectangle, I will enter the word smell on the top line—by the way, I am going for “how something smells.” Under that, I will begin to list all of the synonyms I can think of that mean about the same thing as “a smell.” Grabbing a thesaurus is a good plan right about now. Also, it helps to use an “a” or “an” in front to make sure you end up with a noun form. You can do this fairly easily with nouns, verbs, adverbs, and adjectives. In this case, I am sticking with nouns. After each synonym, connect the specific words to other words that naturally seem to hover around those nouns. Then, talk about these words and how they can and should be used. Doing this exercise every once in a while with your learners can help them be more specific. Using the right words with the right words can clear up what they really want to say! My family and I have played a really cool game throughout our years together. My wife and I thought it up when we were traveling on vacation several years ago, and it remains as one of my all-time favorites (not sure anyone else agrees!!). It only requires a brain, a vocabulary, and a voice. It’s a kind of free-word association game. It is loosely modeled around the psychological test called “Free Association”, and it was often used to help clients learn how to articulate their thoughts and feelings. Well, as a wordsmith, this game converts beautifully when you want to explore not only your innermost thoughts about life and experiences, but also to become a wise word wrangler. Here’s how it works. Start with ANY word you want—such as ball. Then, after you speak the word, the next person free-associates it to some other word that can be a part of its group by means of synonyms, antonyms, homophones, homographs, rhyme, and collocations. Now, let’s review briefly what each of these word relationships includes. · Synonyms are word pairs or groups that have a similar meaning. · Antonyms are word pairs that are opposites. · Homophones are word pairs that sound exactly the same, even if they are spelled differently. · Homographs are words that are spelled the same but have different meanings. · Rhyming words are simple—words rhyme exactly when they begin with different letters but share the same vowel and the letters that come after the vowel. This part of the word is called the rime. The changing first letter is called the onset. · Collocations are word groups that often appear together in our language. Watch how the following example shows a progression of words and related words based on the initial start word: ball. ball>bat>cave>Batman>superhero>Spiderman>web>Charlotte>Wilbur>pig>pen>pencil>stencil…and so on. It is exciting to see how the game develops, and it’s never the same game twice. If you think carefully about this example, you will see almost every kind of relationship that can exist between the words. You will also notice that it taps into one’s awareness of literature, culture, and possibly any of life’s experiences. It’s really fun to discuss how the relationship actually fits based upon your experience. And, yes, there are times when the relationship is too far out there to be counted, but this word game is a sure-fired way to develop and broaden vocabulary and your ability to think. Mostly, it promotes communication. Give it a try sometime during the holidays when you are gathering with friends and family. It can be a big hit!